Adventures with God is the recent television series from acclaimed filmmaker, Darren Wilson, which highlights the amazing things God is doing around the world. Darren combines new adventures with old, adding never-before-seen moments and backstory, as well as an all-new series of roundtable discussions with many of the people featured in his films. The point of it all is to ask big questions about God and faith that most of the church shies away from. Season 1 includes 20 episodes, with 5 all-new adventures in Rome, Greece, South Africa, and Brazil and features a wide-ranging cast of people like Bill Johnson, Kim Walker-Smith, Randy Clark, Robby Dawkins, and many more! Season 2 includes 20 episodes, with 5 all-new adventures in New York, South Carolina, St. Louis, and Africa, and features a wide-ranging cast of people like Bill Johnson, Jake Hamilton, Big Daddy Weave, Heidi Baker, and many more! 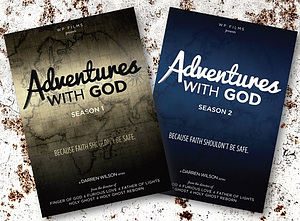 Adventures With God Seasons 1 & 2 by Darren Wilson was published by Eden bundles in May 2018 and is our 24735th best seller. The ISBN for Adventures With God Seasons 1 & 2 is EDENBUNDLE-2125. Be the first to review Adventures With God Seasons 1 & 2! Take a peek at some articles related to Adventures With God Seasons 1 & 2. Got a question? No problem! Just click here to ask us about Adventures With God Seasons 1 & 2.